The historic Texas drought caused the Ogallala Aquifer to experience its largest decline in 25 years across a large swath of the Texas Panhandle, new numbers from a water district show. The 16-county High Plains Underground Water Conservation District reported this week that its monitoring wells showed an average decline last year of 2.56 feet — the third-largest in the district’s 61-year history, and three times the average rate over the past decade. 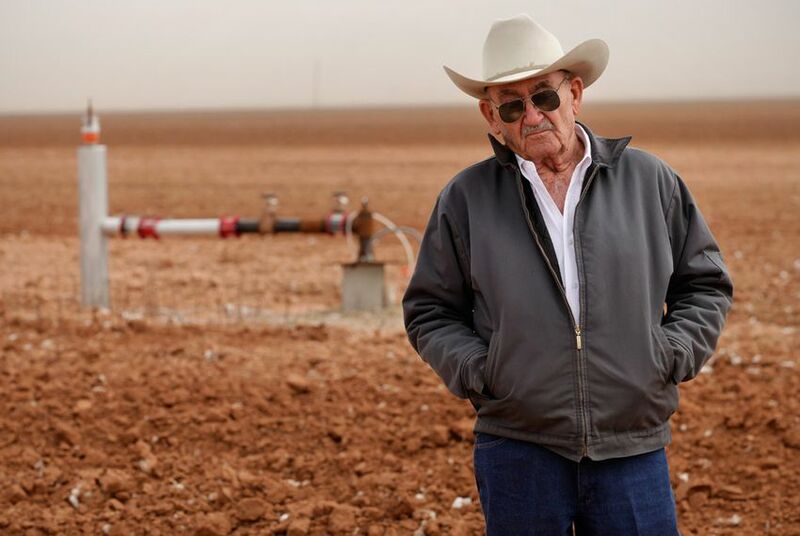 Farmers pumped more water during the drought to compensate for the lack of rainfall, which was about two-thirds less than normal last year in Lubbock and Amarillo. Further north in the Panhandle, along the state's border with Oklahoma, a second water district also registered large declines in the Ogallala. Steve Walthour, the general manager of the eight-county North Plains Groundwater Conservation District, calculated on Monday that the average drop in the Ogallala reached 2.9 feet last year. "We’ve seen some pretty heavy declines," Walthour said, noting that the west side of his district got hit especially hard. Given the catastrophic nature of the drought, which was the most intense in recorded state history, some farmers said things could have been worse. “You never want to pull that much down, but under the circumstances I think we’re probably coming out pretty well,” said Tommy Fondren, who rents out his land in Crosby County for cotton farming. Brad Heffington, a cotton farmer based in Lamb County, pointed out that the Ogallala in the High Plains Underground Water District was essentially stable in 2010, a rainy year that allowed for some replenishing of the aquifer. Some of the counties with larger declines had large amounts of groundwater, he said — and farmers were clearly making use of it, judging from the drops. One observation well in Floyd County recorded a decline of more than 25 feet, according to the High Plains water district. Heffington, who is also the chairman of the group Plains Cotton Growers, said that farmers were doing their best to conserve the resource. But “the bottom line is, it’s a finite resource and we’re mining it,” he said. His own farm experienced declines of up to two feet last year, and the place remains exceptionally dry, with less than 5 inches of rain since July 3, 2010. The severe drops come amid a swirl of debate over new metering requirements in the High Plains district, along with a first-ever cap on the amount of water farmers can pump. (The requirements are not yet enforced.) A study published this year by a University of Texas scientist and other groups projected that depletion of the Ogallala will severely impact farming in the Panhandle and across the Great Plains. As for this year, farmers say that spring rains have helped, but most of the Panhandle remains in moderate drought, or worse. Fondren is holding out hope for showers soon. "We’re going to go back to pumping pretty hard again if we don’t get some rain," he said.